At a time when some are questioning the future of the residential college campus, we believe the investment in these new facilities, which will house new research and teaching venues, several academic departments, a much-expanded student center, a digital media center and a variety of hospitality and programming spaces, will greatly enhance the campus experience for all those who study, live, work here and visit Notre Dame, as well as new amenities that will deliver outstanding game day experiences for Irish fans. Since its founding, one of Notre Dame’s greatest assets has been the boldness of its vision – the ability to see possibilities and connections where others saw only obstacles and fragmentation. This project continues that boldness of vision. -Notre Dame president, John I. Jenkins, C.S.C. While I once felt embarrassed feeling lost (if not losing my center) when returning for a football game to the University I once knew like the back of my hand, it now (thankfully) appears I'm not the only one. Indeed, Notre Dame has expanded exponentially, and in most cases willy-nilly, since I was at home under the Dome some thirty years ago. 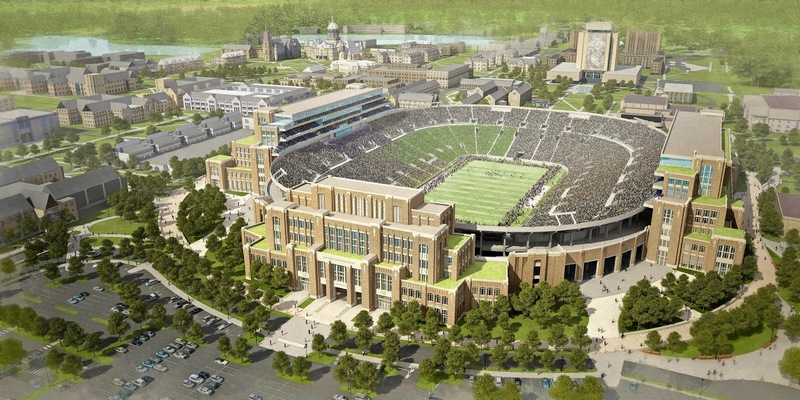 Fortunately, the mighty Notre Dame Crossroads Project promises, by "the integration of athletics into the academic mission," to put an end to all this not-well-planned expansion. Which is precisely what I'm afraid of. When it comes to building, the idea that "bigger is better" is as old as Babel, and, when it comes to this ill-conceived colossus (dubbed "Rockne Mountain High" by Notre Dame architecture graduate, Matthew Balkey) of classrooms, music, media and entertainment centers attached to the mayhem of an 80,000 seat football stadium has about as much chance of succeeding aesthetically—not to mention spiritually—as its biblical counterpart. As Balkey notes, "The alumni to whom I have spoken express a failure on the part [of] the university to adequately articulate why, pedagogically speaking, putting sacred music in near proximity to football...produces any particular benefit to sacred music, or to football...the stadium [academic] connection seems tenuous at best." Really? How about the sacred music students drowning out Michigan's famous "Hail! to the victors valiant" fight song—with Gregorian chant, no less? Or psychology students (among the groups to be housed in the stadium complex) running out of the tunnel with the team shouting subtle psychically damaging slogans at the Wolverines—or similar uplifting mantras to the Irish? The possibilities are endless! Actually the real probabilities are very few. By adding—and selling—several thousand luxury seats (did Father forget to mention those luxury boxes in his "bold vision" statement? ), Jenkins and his henchmen figure to easily recoup the $400 to $600 million the academic attachments should cost...and at the same time finally be able to say to Michigan and its less brainy football rivals, "Our stadium is bigger than yours!" But in this "subjection of the academic mission of the university to the needs of the all-powerful axis of athletics and development," as Fr. Bill Miscamble, C.S.C., history professor at Notre Dame (and the number one authority on all things that hurt Our Lady's University) calls it, the Crossroads Project will be more costly than Jenkins and company think. First, from a sheerly architectural standpoint, the proposed structure is a disaster. As fifth year Notre Dame senior Nathaniel Gotcher notes, "the quad system of the University is completely overlooked in a design that turns the three buildings proposed away from each other and not toward each other. 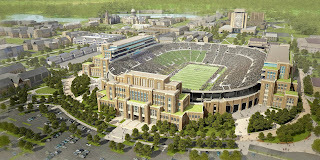 Instead, they have a huge field that nobody will be allowed to use lying between them, blocking any natural path from one to another," while Balkey explains, "In a unique nod to the 1920s and 30s in which Notre Dame football achieved national prominence, the massing of the three pavilions is terraced back as if subject to the New York City planning laws that generated such landmarks as the Empire State Building and Rockefeller Center...Alas, the comparison seems to end there. The 1930s bowl of the stadium was reputed for its half mile circumference; without permeability, each subsequent renovation only increases the distance to navigate around its hulking mass. It’s a stark contrast with Rockefeller Center, where public spaces of 5th Avenue and the interstitial plazas are more famous than the actual buildings." But if the students of architecture are not impressed, the teachers of (salvation) history such as Miscamble are even more blunt. "The proposed three buildings," according to Miscamble, "appear to have been influenced in their design by the Fascist architectural style. They look like something Albert Speer might have worked on in his early period. I suppose such buildings are erected as statements of wealth and power and are meant to overwhelm. However, they serve mainly as a demonstration of institutional self-aggrandizement that carries an unmistakable message of nouveau riche excess. It is a bad message for Notre Dame to convey to its students." In other words, the "state of the art" building is revealed to be merely the art of the State, the ultimate cathedral to what Jenkins' former bishop, John D'Arcy, once called "prestige over Truth." As Miscamble goes on to explain, "the suggestion that the stadium will be the center and crossroads of campus is similarly ill-chosen. The Basilica and Our Lady atop the Dome must always remain at the heart of Notre Dame, and the campus must radiate out from them. There is already a crossroad in the present design of Notre Dame’s campus but it would appear that our administrators have forgotten about it." Certainly, every true "loyal son" of Notre Dame knows, as Miscamble states, that "[m]uch more is at stake here than a debate over buildings...in the end a bold vision for Notre Dame will be forged more by what goes on within its buildings than by the buildings themselves." Or, as John Lyon, a history/literature double major who graduated from Notre Dame back in 1955, wryly adds, "Perhaps an institutional drift toward elephantiasis, specialization [and] re-orientation...of priorities is inevitable at a modern university, even a Catholic one. Perhaps the Land of Lakes 'Statement'...[was] most prudent. Perhaps the Campus Crossroads Project should be celebrated. Perhaps. [Or] [p]erhaps we should also recall that, in many traditions, it was at the crossroads, a place 'between the worlds,' that suicides were buried." Notre Dame—and Notre Dame football—should be more worried about solving the institutional flaws that led up to the Lizzy Seeberg suicide (and its cover-up) than building yet another monument to blot out her memory. But, because Notre Dame is "between the worlds" of Truth and prestige, God and money, they think that perhaps just one more building, the biggest classroom/student/stadium complex ever, will finally be the key to getting them accepted as "another" Stanford. And, by doing so, they will instead completely lose the connection with the one Lord who has made them the "only" Notre Dame. In the end, the Crossroads Project is merely "the Rockne Mountain Lie," the latest and greatest fabrication in the "nouveau Notre Dame" myth. Rockne's real Notre Dame vision was to give American Catholic immigrants a team to be proud of in a land then dominated by WASPs, and their children true Catholic heroes to look up to. Leahy expanded upon that vision by giving American Catholic boys (especially big and fast ones) something to aspire to, and helped kids get hooked on the Faith by giving them something concrete to pray for on Saturday as well as Sunday, while Holtz revived this vision, and, like Vatican II, made it relevant for our times. In trading away this wholesome, moral vision of football for one that makes the Fighting Irish into just another entertainment "brand" to which corporations may attach their money, Jenkins has not only traded the dream of Rockne for that of Rockefeller, but his "Crossroads" will transform "the house that Rockne built" into a monument to the New York billionaire as well. 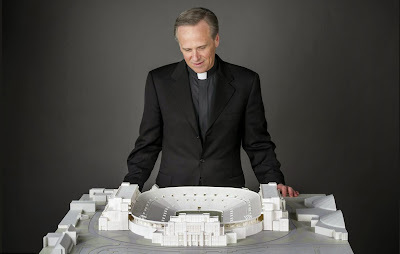 For if this monstrosity is built and the crossroads of the campus shifts from the Church, grotto, and Golden Dome, to this "mountain that Mammon built," the war to save Notre Dame as a Catholic institution will be all but over. And, while prayer and petition should always be the first means to combat injustice, one wonders if the civil disobedience of Martin Luther King (or even Cliven Bundy) may occur next...or if, in these once again dark days to be a Catholic in this country, there are enough loyal sons and daughters left to come to Her aid if it does.